John Boorman and Kieran Corrigan have launched the Irish Film School at the Lir Academy Dublin. Starting from Monday October 22nd, the Irish Film School, based at The Lir Academy in central Dublin, will provide intensive, hands-on classes in filmmaking taught by leading international film and TV professionals, including Roger Corman and 2018 Academy Award winners DNEG. According to the new School's website and press release, Irish Film School: "provides professional training courses in filmmaking, film production, visual FX and the business of film. The training courses have been designed by the founders who lead a team of accomplished instructors, including Roger Corman and Academy Award winning VFX house DNEG. These courses will help students to develop the creative, technical and business filmmaking skills needed for today's dynamic global film industry." 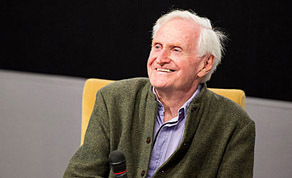 John Boorman said: "Filmmaking is the process of turning money into light and then back into money again. In the past I have often been asked to help out and teach this concept by the film industry and I really do what I can. Young filmmakers often come to me to ask for advice and I try to give it to them. I have fifty years of experience in filmmaking and I founded Irish Film School in order to help young filmmakers to avoid all of the mistakes that I have made during my life in film. Also, to communicate my thoughts about film and the kind of film that can be made in the future, using the most modern technologies and equipment." The Irish Film School will be running five short, intensive training courses in autumn 2018 and spring/summer 2019 in Dublin, London and Beijing. This is a Five-Day (5 day) course priced at €1,950. This is a One-Day (1 day) course priced at €495. This is a Three-Day (3 day) course priced at €850. This is a One-Day (1 day) course priced at €850. Summarising the course programme, co-founder Kieran Corrigan said, "Education is such a critical aspect of all industries. Teaching people best practice and training people in the industry is key. As a teacher for years in Trinity College Dublin and University College Dublin, where I lectured in law, I have first-hand knowledge of the value of education. The film and television industry is rapidly changing and developing in a whole range of areas. This includes a new focus on post-production techniques, advanced digital services available and a much-needed spotlight on gender equality. It is essential that people entering the industry today from countries around the world have an understanding of the relevant, practical skills that are needed to thrive. John's knowledge, experience and expertise is second to none in the industry." Lisa Wright who is the Director of Education at the new film school said, "This is a new way for students to upskill and gain relevant and valuable experience studying with experienced film professionals. The methodology we use is based on an apprenticeship approach."